Sift the cocoa powder, flour, baking powder and soda bi-carbonate. Combine all the ingredients together with 1/2 cup (100 ml.) of water in a bowl and mix well using a whisk. Pour this mixture into a greased 150 mm. (6") diameter baking tin. Bake in a pre-heated oven at 180°C (360°F) for 20 minutes or till a knife inserted into the cake comes out clean. Unmould and cool on a wire rack. Put the cream in a saucepan and bring it to a boil. Remove from the flame. Add the chopped chocolate and mix well using a whisk till it becomes a smooth sauce. Cool completely and keep aside. Slice the chocolate cake horizontally into two equal parts. Place the top half of the cake on a serving plate and soak with half the soaking syrup. Spread a generous layer of the truffle icing and the chopped mango. Sandwich with the other half of the cake and soak this half with the remaining soaking syrup. Spread another layer of the truffle icing on top. Cover the sides of the cake with the chocolate cream wafer biscuit rolls. 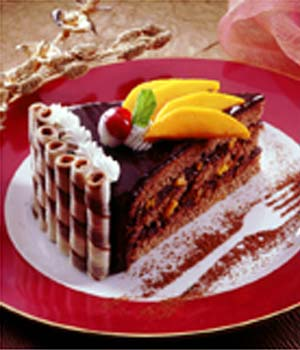 Decorate with swirls of whipped cream, mango slices, cherries and mint leaves. @ abeda ASAK , Rum is alcoholic beverage. oh come on try to five your own recipes, this is also copied from Tarla Dalal's website.